PT Gapura Angkasa - Gapura Angkasa is a reputable ground handling and flight support company in Indonesia. Gapura Angkasa running business in passenger and baggage handling, cargo, warehousing, flight operations, and aircraft services. PT Gapura Angkasa is owned together by state-owned airline giant PT Garuda Indonesia (Persero) Tbk (Garuda Indonesia Group) with 2 state-owned airport operators; PT Angkasa Pura I (Persero) and PT Angkasa Pura II (Persero). As of December 2015, Gapura Angkasa is 58.75% owned by Garuda Indonesia Group, 31.25% by PT Angkasa Pura II (Persero), and 10% by PT Angkasa Pura I (Persero). Gapura Angkasa is based in Jakarta and now has 30 branches and 20 representative offices spread in all over Indonesia. In term of financial performance, Gapura Angkasa recorded a satisfiying financial result in 2015. 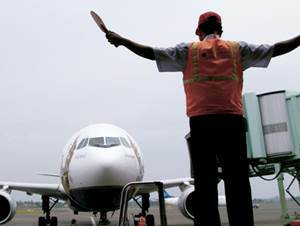 According to PT Garuda Indonesia (Persero) Tbk Annual Report 2015 as cited by JobsCDC.com, Gapura Angkasa booked total operating profit of Rp 53.80 billion in 2015, or increased drastically by 52.87% from Rp 35.19 billion in the previous year (2014). As of the end of December 2015, Gapura Angkasa’s total operating revenue amounted to Rp 1.32 trillion, up 8.95% from Rp 1.21 trillion at the end of December 2014. Male/Female, not older than 25 years of age. Minimum Diploma holder in any field. Both experienced (maximum 2 years of experience) and fresh graduate candidates are highly welcome. Fast learner, energetic, good leadership and achievement orientation. Able to work in multitasking and under pressure. English language proficiency both spoken and written (TOEIC certified). Computer literate and software (Microsoft Office, Internet and others). JobsCDC.com now available on android device. Download now on Google Play here. Please be aware of recruitment fraud. The entire stage of this selection process is free of charge. PT Gapura Angkasa - Fresh Graduate ODP Program Garuda Group December 2016 will never ask for fees or upfront payments for any purposes during the recruitment process such as transportation and accommodation.